The State of Israel (Hebrew: מְדִינַת יִשְׂרָאֵל, Medinat Yisra'el from יִשְׂרָאֵל Yisra'el, "Struggled with God") is a nation located in the Middle East. It is the world's only Jewish state, having emerged from Zionism in Europe and the U.S. in the 1880s-1940s. It grants citizenship to anybody considered to be Jewish, although this does not apply to anyone suspected or convicted of serious crimes or who the state otherwise considers a serious threat to its welfare. It also contains Arab Muslim and Arab Christian minorities who are remnants of the pre-1948 Arab majority, along with a small Druze community. It is the location of most Biblical events. Israel occupies an area along the eastern Mediterranean Sea, with Jordan and Syria to the east; Lebanon on the north; and Egypt to the south. 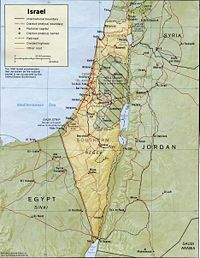 The territories of the West Bank and Gaza Strip are currently controlled by Israel, but disputed. The terrain varies from a temperate, coastal climate to desert conditions. Israel shares with Jordan the shoreline of the Dead Sea, at 1,378 feet below sea level. Of the approximately 6.43 million Israelis in 2007 about 76% were counted as Jewish, though some of those are not considered Jewish under Orthodox Jewish law. Since 1989, nearly a million immigrants from the former Soviet Union have arrived in Israel, making this the largest wave of immigration since independence. In addition, an estimated 105,000 members of the Ethiopian Jewish community have immigrated to Israel, 14,000 of them during the dramatic May 1991 Operation Solomon airlift. 32.9% of Israelis were born outside of Israel. The three broad Jewish groupings are the Ashkenazim, or Jews who trace their ancestry to Central Europe; the Sephardim, who trace their origin to Spain, Portugal, southern Europe, and North Africa; and Eastern or Oriental Jews, who descend from ancient communities in Islamic lands. Of the non-Jewish population, about 68% are Muslims, about 9% are Christian, and about 7% are Druze. At a Bar Mitzvah in the Western Wall tunnel. Education is compulsory from age 6 to 16 and is free up to age 18. The school system is organized into kindergartens, 6-year primary schools, 3-year junior secondary schools, and 3-year senior secondary schools, after which a comprehensive examination is offered for university admissions. There are seven university-level institutions in Israel, a number of regional colleges, and an Open University program. The majority of families in Israel - Jewish and Arab - send their children to segregated schools. This segregation poses a distinct problem, tending to promote rival viewpoints and attitudes that become ripe for exploitation by proponents of violence. Within Israel, the schools of the minority Arab population become incubators for resentment and hostility, while the schools of the majority Jewish population tend to reinforce a sense of insulation from the concerns of others. With a population drawn from more than 100 countries on 5 continents, Israeli society is rich in cultural diversity and artistic creativity. The arts are actively encouraged and supported by the government. The first Jewish artist on record was named Bezalel, an architect, sculptor and designer of holy garments best known for purportedly making the Tabernacle that contained the Ark of the Covenant. The Israeli Philharmonic Orchestra performs throughout the country and frequently tours abroad. The Jerusalem Symphony and the New Israel Opera also tour frequently, as do other musical ensembles. Almost every municipality has a chamber orchestra or ensemble, many boasting the talents of gifted performers from the countries of the former Soviet Union. Israel has several professional ballet and modern dance companies, and folk dancing, which draws upon the cultural heritage of many immigrant groups, continues to be very popular. There is great public interest in the theater; the repertoire covers the entire range of classical and contemporary drama in translation as well as plays by Israeli authors. Of the three major repertory companies, the most famous, Habimah, was founded in 1917. Active artist colonies thrive in Safed, Jaffa, and Ein Hod, and Israeli painters and sculptors exhibit works worldwide. Israel boasts more than 120 museums, including the Israel Museum in Jerusalem, which houses the Dead Sea Scrolls along with an extensive collection of regional archaeological artifacts, art, and Jewish religious and folk exhibits. Israelis are avid newspaper readers, with more than 90% of Israeli adults reading a newspaper at least once a week. Major daily papers are in Hebrew; others are in Arabic, English, French, Polish, Yiddish, Russian, Hungarian, and German. David Ben Gurion, the First Prime Minister of Israel, publicly pronouncing the Declaration of the State of Israel, May 14, 1948, Tel Aviv, Israel, beneath a large portrait of Theodore Herzl, founder of modern political Zionism, in the old Tel Aviv Museum of Art building on Rotshild St.
Israel is a parliamentary democracy with a governmental system based on several basic laws (similar to but not comprising a formal constitution) enacted by its unicameral parliament, the Knesset. The president (chief of state) is elected by the Knesset for a 5-year term. The prime minister (head of government) exercises executive power and has in the past been selected by the president as the party leader most able to form a government. Between May 1996 and March 2001, Israelis voted for the prime minister directly. (The legislation, which required the direct election of the prime minister, was rescinded by the Knesset in March 2001.) The members of the cabinet must be collectively approved by the Knesset. The Knesset's 120 members are elected by secret ballot to 4-year terms, although the prime minister may decide to call for new elections before the end of the 4-year term (this is frequent since, due to the multi-party system in place, no single party has enough members to control the Knesset, thus requiring coalitions which nearly always collapse before the term ends). Voting is for party lists rather than for individual candidates, and the total number of seats assigned each party reflects that party's percentage of the vote (except that a party must receive 3.25% of the national vote to be assigned a seat). Successful Knesset candidates are drawn from the lists in order of party-assigned rank. Under the present electoral system, all members of the Knesset are elected at large. The independent judicial system includes secular and religious courts. The courts' right of judicial review of the Knesset's legislation is limited. Judicial interpretation is restricted to problems of execution of laws and validity of subsidiary legislation. The highest court in Israel is the Supreme Court, whose judges are approved by the President. Israel is divided into six districts, administration of which is coordinated by the Ministry of Interior. The Ministry of Defense is responsible for the administration of the occupied territories. From the founding of the modern state of Israel in 1948 until the election of May 1977 Israel was ruled by successive coalition governments led by the Labor alignment or its constituent parties. From 1967-70 the coalition government included all of Israel's parties except the communist party. After the 1977 election the Likud bloc, then composed of Herut, the Liberals, and the smaller La'am Party, came to power forming a coalition with the National Religious Party, Agudat Israel, and others. As head of Likud, Menachem Begin became Prime Minister. The Likud retained power in the succeeding election in June 1981, and Begin remained Prime Minister. In the summer of 1983, Begin resigned and was succeeded by his Foreign Minister, Yitzhak Shamir. After Prime Minister Shamir lost a Knesset vote of confidence early in 1984, new elections in July provided no clear winner, with both Labor and Likud considerably short of a Knesset majority and unable to form even narrow coalitions. After several weeks of difficult negotiations, they agreed on a government of national unity, including the rotation of the office of Prime Minister and the combined office of Vice Prime Minister and Foreign Minister midway through the government's 50-month term. During the first 25 months of unity government rule, Labor's Shimon Peres served as Prime Minister, while Likud's Shamir held the posts of Vice Prime Minister and Foreign Minister, until they switched positions in October 1986. In November 1988 elections, Likud edged Labor out by one seat but was unable to form a coalition, producing another national unity government in January 1989. Yitzhak Shamir became Prime Minister, and Shimon Peres became Vice Prime Minister and Finance Minister. This government fell in March 1990, however, in a vote of no confidence precipitated by disagreement over the government's response to U.S. Secretary of State Baker's initiative in the peace process. Labor Party leader Peres was unable to attract sufficient support among the religious parties to form a government. Yitzhak Shamir then formed a Likud-led coalition government, including members from religious and right-wing parties. Shamir's government took office in June 1990, and held power for 2 years. In the June 1992 national elections, the Labor Party reversed its electoral fortunes, taking 44 seats. Labor Party leader Yitzhak Rabin formed a coalition with Meretz (a leftist party) and Shas (an ultra-Orthodox religious party). The coalition included the support of two Arab-majority parties. Rabin became Prime Minister in July 1992, presiding over the signing of the Oslo accords with the Palestine Liberation Organization. However, Rabin was assassinated by a right-wing Jewish radical on November 4, 1995. Peres, then Deputy Prime Minister and Foreign Minister, once again became Prime Minister and immediately proceeded to carry forward the peace policies of the Rabin government and to implement Israel's Oslo commitments, including military redeployment in the West Bank and the holding of historic Palestinian elections on January 20, 1996. Enjoying broad public support and anxious to secure his own mandate, Peres called for early elections after just 3 months in office. (They would have otherwise been held by the end of October 1996.) In late February and early March, a series of suicide bombing attacks by Palestinian terrorists took some 60 Israeli lives, seriously eroding public support for Peres and raising concerns about the peace process. Increased fighting in southern Lebanon, which also brought Katyusha rocket attacks against northern Israel, also raised tensions and weakened the government politically a month before the May 29 elections. In those elections—the first direct election of a Prime Minister in Israeli history—Likud leader Binyamin Netanyahu won by a narrow margin, having sharply criticized the government's peace policies for failing to protect Israeli security. Netanyahu subsequently formed a right-wing coalition government publicly committed to pursuing the peace process, but with an emphasis on security and reciprocity. In 1999, with a shrunken coalition and facing increasing difficulty passing legislation and defeating no-confidence motions, Netanyahu dissolved parliament and called for new elections. This time, the Labor candidate—Ehud Barak—was victorious. Barak formed a mixed coalition government of secular and religious parties, with Likud in the opposition. In May 2000, Barak fulfilled one of his major campaign promises by withdrawing Israeli forces from Southern Lebanon. However, by mid-autumn, with the breakdown of the Camp David talks and the worsening security situation caused by the new intifada, Barak's coalition was in jeopardy. In December, he resigned as Prime Minister, precipitating a new prime ministerial election. In a special election on February 6, 2001, after a campaign stressing security and the maintenance of Israeli sovereignty over Jerusalem, Likud leader Ariel Sharon defeated Barak by over 20 percentage points. As he had promised in his campaign, Sharon formed a broad unity government that included the Labor and Likud parties, the far-right parties, some smaller secular parties, and several religious parties. The unity government collapsed in late 2002, and new elections were held in January 2003. Sharon again won, and formed a new government consisting of his own Likud party, the right-wing National Religious Party and National Union party, and centrist Shinui. The summer of 2004 saw renewed instability in the government, as disagreement over the Gaza disengagement plan resulted in Sharon's firing two ministers of the National Union Party and accepting the resignation of a third from the National Religious Party in order to secure cabinet approval of the plan (it was endorsed on June 6, 2004). Continuing divisions within the Likud on next steps then prompted Ariel Sharon to leave the party in November 2005 to form the Kadima ("Forward") party and call new elections for March 2006. However, Sharon was unexpectedly incapacitated in January 2006 due to a severe stroke and leadership of Kadima shifted to Acting Prime Minister Ehud Olmert, who on March 28 led the party to 29 seats in the Knesset. Labor came in second with 19 seats, and Shas and Likud tied with 12. After intensive coalition negotiations, a new, Kadima-led government, with Labor as "senior partner", was sworn in on May 4, 2006. In addition to seeking an end to hostilities with Arab forces, against which it has fought five wars since 1948, Israel has given high priority to gaining wide acceptance as a sovereign state with an important international role. Before 1967, Israel had established diplomatic relations with a majority of the world's nations, except for the Arab states and most other Muslim countries. UN Security Council resolutions provided the basis for cease-fire and disengagement agreements concerning the Sinai and the Golan Heights between Israel, Egypt, and Syria and for promoting the Camp David accords and the Egyptian-Israeli Peace Treaty. The Soviet Union and the communist states of Central Europe (except Romania) broke diplomatic relations with Israel during the 1967 war, but those relations were restored by 1991. The landmark October 1991 Madrid conference recognized the importance of Security Council Resolutions 242 and 338 in resolving regional disputes, and brought together for the first time Israel, the Palestinians, and the neighboring Arab countries, launching a series of direct bilateral and multilateral negotiations. These talks were designed to finally resolve outstanding security, border, and other issues between the parties while providing a basis for mutual cooperation on issues of general concern, including the status of refugees, arms control and regional security, water and environmental concerns, and economic development. Today, Israel has diplomatic relations with 161 states. Following the signing of the Israel-PLO Declaration of Principles on September 13, 1993, Israel established or renewed diplomatic relations with 36 countries. Israel has full diplomatic relations with Egypt, Jordan, and Mauritania. In addition, on October 1, 1994, the Gulf States publicly announced their support for a review of the Arab boycott, in effect abolishing the secondary and tertiary boycotts against Israel. Israel has diplomatic relations with nine non-Arab Muslim states and with 32 of the 43 Sub-Saharan states that are not members of the Arab League. Israel established relations with China and India in 1992 and with the Holy See in 1993. Benjamin Netanyahu and Barack Obama in 2008. Commitment to Israel's security and well being has been a cornerstone of U.S. policy in the Middle East since Israel's founding in 1948, in which the United States played a key supporting role. Israel and the United States are bound closely by historic and cultural ties as well as by mutual interests. Continuing U.S. economic and security assistance to Israel acknowledges these ties and signals U.S. commitment. The broad issues of Arab-Israeli peace have been a major focus in the U.S.-Israeli relationship. U.S. efforts to reach a Middle East peace settlement are based on many critical security interests. The United States' strong national security interests in promoting regional security in the Middle East and curtailing acts of terrorism both in Israel and abroad are supported in part by UN Security Council Resolutions 242 and 338. As one of the most technologically advanced countries in the world, the United States also has a strong interest in promoting Israel's economic success. On a bilateral level, relations between the United States and Israel are continually strengthening in every field. In addition to the Joint Political-Military Group described above, there are: bilateral science and technology efforts (including the Binational Science Foundation and the Binational Agricultural Research and Development Foundation); the U.S.-Israeli Education Foundation, which sponsors educational and cultural programs; the Joint Economic Development Group, which maintains a high-level dialogue on economic issues; the Joint Counterterrorism Group, designed to enhance cooperation in fighting terrorism; and a high-level Strategic Dialogue that meets biannually. On December 6, 2017, President Donald Trump announced the United States would finally recognize Jerusalem as the capital of Israel and that the U.S. Embassy would be moved from Tel Aviv to Jerusalem. Israel's ground, air, and naval forces, known as the Israel Defense Force (IDF), fall under the command of a single general staff. Conscription is universal for Israeli men and women over the age of 18, although exemptions may be made on religious grounds. Druze, members of a small Islamic offshoot living in Israel's mountains, also serve in the IDF. Israeli Arabs, with the exception of some Bedouins, do not serve. During 1950-66, Israel spent an average of 9% of GDP on defense. Real defense expenditures increased dramatically after both the 1967 and 1973 wars. Military spending in 2005 totaled $9.45 billion, which is equivalent to 7.7% of GDP, and represents 16.3% of government expenditures. The United States provides approximately $2.4 billion per year in security assistance. In 1983, the United States and Israel established the Joint Political Military Group, which meets twice a year. Both the U.S. and Israel participate in joint military planning and combined exercises, and have collaborated on military research and weapons development. Israel has a diversified, technologically advanced economy with substantial but decreasing government ownership and a strong high-tech sector. The major industrial sectors include high-technology electronic and biomedical equipment, metal products, processed foods, chemicals, and transport equipment. Israel possesses a substantial service sector and is one of the world's centers for diamond cutting and polishing. It also is a world leader in software development and, prior to the violence that began in September 2000, was a major tourist destination. Israel's strong commitment to economic development and its talented work force led to economic growth rates during the nation's first two decades that frequently exceeded 10% annually. The years after the 1973 Yom Kippur War were a lost decade economically, as growth stalled and inflation reached triple-digit levels. The successful economic stabilization plan implemented in 1985 and the subsequent introduction of market-oriented structural reforms reinvigorated the economy and paved the way for rapid growth in the 1990s. A wave of Jewish immigration beginning in 1989, predominantly from the countries of the former U.S.S.R., brought nearly a million new citizens to Israel. These new immigrants, many of them highly educated, now constitute some 13% of Israel's 6.7 million inhabitants. Their successful absorption into Israeli society and its labor force forms a remarkable chapter in Israeli history. The skills brought by the new immigrants and their added demand as consumers gave the Israeli economy a strong upward push and in the 1990s, they played a key role in the ongoing development of Israel's high-tech sector. GDP (2006 est. ): $170.3 billion. Annual growth rate (2006): 4.8%. Per capita GDP (2006): $26,800. Currency: Shekel (4.13 shekels = 1 U.S. dollar; 2007 est.). Natural resources: Copper, phosphate, bromide, potash, clay, sand, sulfur, bitumen, manganese. Agriculture: Products—citrus and other fruits, vegetables, beef, dairy, and poultry products. Industry: Types—high-technology projects (including aviation, communications, computer-aided design and manufactures, medical electronics, fiber optics), wood and paper products, potash and phosphates, food, beverages, tobacco, caustic soda, cement, construction, plastics, chemical products, diamond cutting and polishing, metal products, textiles, and footwear. Trade: Exports (2006 est.) --$42.86 billion. Exports include polished diamonds, electronic communication, medical and scientific equipment, chemicals and chemical products, electronic components and computers, machinery and equipment, transport equipment, rubber, plastics, and textiles. Imports (excluding defense imports, 2006 est.) --$47.8 billion: raw materials, diamonds, energy ships and airplanes, machinery, equipment, land transportation equipment for investment, and consumer goods. Major partners—U.S., U.K., Germany; exports—U.S., Belgium, Hong Kong; imports—U.S., Belgium, Germany, Switzerland, U.K.
During the 1990s, progress in the Middle East peace process, beginning with the Madrid Conference of 1991, helped to reduce Israel's economic isolation from its neighbors and opened up new markets to Israeli exporters farther afield. The peace process stimulated an unprecedented inflow of foreign investment in Israel, and provided a substantial boost to economic growth in the region over the last decade. The onset of the intifada beginning at the end of September 2000, the downturn in the high-tech sector and Nasdaq crisis, and the slowdown of the global economy have all significantly affected the Israeli economy. However, despite the recent conflicts in Gaza and Lebanon, the Israeli economy grew during 2006. Israeli companies, particularly in the high-tech area, have in the past enjoyed considerable success raising money on Wall Street and other world financial markets; Israel ranks second to Canada among foreign countries in the number of its companies listed on U.S. stock exchanges. Israel's tech market is very developed, and in spite of the pause in the industry's growth, the high-tech sector is likely to be the major driver of the Israeli economy. Almost half of Israel's exports are high tech. Most leading players, including Intel, IBM, and Cisco have a presence in Israel. Growth was an exceptional 6.2% in 2000, due in part to a number of one-time high tech acquisitions and investments. This exceptional year was followed by two years of negative growth of -0.9% and -1%, respectively, in 2001 and 2002. As a result of the security situation and the associated downturn in the economy, there was a significant rise in unemployment and wage erosion. This led to a decline in private consumption in 2002, the first time that there had been negative private consumption since the early 1980s. However, following growth rates of 1.7% in 2003 and 4.4% in 2004, the Israeli economy entered into a period of stabilization and recovery after the deep recession of 2001 and 2002. Since then, the Israeli economy seems to have returned to a trend of consistent growth. The Israeli economy grew by 5.2% in 2005 and GDP per capita (U.S. $17,800) increased by 3.3%. The Israeli economy grew by an estimated 4.8% in 2006. Exports of goods and services in Israel grew by 7% in 2005. Service and agricultural exports each increased by more than 10% in 2005, whereas exports increased by 5.6% and imports rose to 4.4%. Israel Tourism revenues increased by 22.7% as a result of the dramatic increase following the intifada's subsidence. Israel's private consumption increased by 4% in 2005. The largest growth in private consumption was in the purchase of clothing, footwear, and personal effects, which increased by 10.2%, following an increase of 5.4% in 2004. Consumption of consumer durables grew much more slowly than in 2004, with an increase of only 3.4%, compared with 14.3% the previous year. In the Israeli business sector, business GDP grew by 6.6% in 2005. According to CBS statistics, the transportation, storage, and communications industries grew by 9.2%, following growth of 6.6% in 2004. The GDP of the wholesale, retail, restaurant, and hotel sector increased by 8.1%, up from 6.1% in 2004. The GDP of the finance and business services sector in 2005 increased by 6.4%, up from the previous year's 6.1% growth rate. The general consensus among economists is that Israel's economy is very strong and that its growth potential is in the 4% to 5% range. Bar Refaeli, model and actress. The United States is Israel's largest trading partner. In 2005, two-way trade totaled some $26.6 billion, up 12% from 2004. The U.S. trade deficit with Israel was $7.1 billion in 2005, up 33% from 2004, due largely to rising Israeli exports to the U.S. U.S. exports to Israel rose 6.1% in 2005 to $9.7 billion, making Israel our 19th largest export market for goods. The principal goods exported from the U.S. include civilian aircraft parts, telecommunications equipment, semiconductors, civilian aircraft, electrical apparatus, and computer accessories. Israel's chief exports to the U.S. include diamonds, pharmaceutical preparations, telecommunications equipment, medicinal equipment, electrical apparatus, and cotton apparel. The two countries signed a free trade agreement (FTA) in 1985 that progressively eliminated tariffs on most goods traded between the two countries over the following 10 years. An agricultural trade accord signed in November 1996 addressed the remaining goods not covered in the FTA but has not entirely erased barriers to trade in the agricultural sector. Israel also has trade and cooperation agreements in place with the European Union, Canada, Mexico, and other countries. Best prospect industry sectors in Israel for U.S. exporters are electricity and gas equipment, defense equipment, medical instruments and disposable products, industrial chemicals, telecommunication equipment, electronic components, building materials/construction industries (DIY and infrastructure), safety and security equipment and services, non-prescription drugs, travel and tourism services, and computer software. Stele of the Canaanite god Baal with a thunderbolt, 15th-13th century BC. Map of the Holy Land Divided into the XII Tribes of Israel, by Emanuel Bowen, PUBLISHED 1752. The first King of Israel was Jeroboam I, who made his capital at Shechem until it was replaced by Samaria under Omri. Almost immediately the Israeli kings "did evil in the sight of the Lord" and turned away from the Lord God. Although they were larger and more powerful than Judah, they fell more quickly due to their apostacy. Israel continued being ruled by kings until its conquest by Assyria in 722 B.C. Judah had a number of kings who did what was right in God's sight, but eventually they too were turning away. They continued as an independent nation until 586 B.C. when they fell to the Babylonians. Both of these conquests led to many Jews being deported from the land of Israel. While under Persian rule after the Babylonians had fallen to the Persians, the Jews were allowed to return and rebuild their temple (520 - 516 B.C.) In the 400's B.C. they began to return to God as well, showing a reverence for Him that was often lacking during the time they had their own kingdom. Still under Persian rule and with their blessing, Nehemiah came to rebuild the walls of Jerusalem, a position that was bitterly opposed by the other peoples living on the land. The Jews had to stand guard as they built. Cochin Jews are the oldest group of Jews in India. When Alexander the Great swept through Israel in 332 B.C., Persian rule had ended to be replaced by Greek. Upon Alexander's death in 323 B.C. there was a fight for power among his generals and subordinates, which led to Israel coming under control of the Ptolemies, the Greek leaders of Egypt. The Jews were treated leniently until the Seleucids, the Greek leaders of Syria, pushed back the Ptolemies and took over Israel in 198 B.C. The Seleucids were not as lenient and under Antiochus IV (175 to 164 B.C.) conditions worsened considerably. In 168 B.C. Judaism was declared to be illegal and a pig was sacrified on the altar of the Jewish temple; the Jews revolted under the Maccabees and fought a prolonged guerrilla war until their eventual religious independence in 164 B.C. Complete acknowledgement of independence from the Seleucids didn't come until 142 B.C. when Roman pressure helped them to make the decision to let Israel go. This independence would last until 63 B.C., when infighting caused the Jews to ask for Roman intervention. Rome stopped the fighting, but Israel came under Roman rule as the province of Palestine. The Jewish people would not have their independence again for over 2000 years. It was under this state of Roman control that Jesus was born around 4 B.C. Three revolts against Roman rule by the Jews, the first in 66 A.D., the next in 115 A.D., and the last in 132 A.D. took place, and failed. After the failure of the third, the Romans forced the Jews to leave Israel thus beginning the diaspora, the dispersal of the Jews from the land of Palestine. By the fifth century the inhabitants of the region were Christianized, under the Byzantine Empire, a situation which continued until the Arab invasions of the 7th and 8th centuries. The Arabs brought with them the Islamic faith which, due to its many similarities with Christianity and Judaism and the social advantages it brought, was gradually adopted by the population. However, Jewish and Christian citizens continued to live in the region, in relative peace, until the Crusades. The Crusades saw part of the Holy Lands reconquered from Islam in the name of Christianity. The Crusader states were temporary before being conquered by Islam again with the fall of the last Crusader state in 1290. First the Mamelukes controlled the area, then starting in the early 1500s, the Ottoman Turks conquered the region. World War I saw a British victory over the Ottoman's and the region came under British mandate of Palestine in 1920. The British and late Ottoman authorities permitted the resettlement of Jews from Europe, many of them looking to establish a Jewish state in the region, part of a movement called Zionism. In the last years of British mandate the number and strength of the Jews in Palestine increased, with many adopting extremely radical tactics to achieve their goal of an independent Jewish state. Terrorist organizations such as Irgun and Lehi attacked British and Arab targets, killing civilians in the process. Britain's occupation became too expensive and they handed control to the United Nations to sort out a solution. The recreation of the State of Israel in 1948 was preceded by more than 50 years of efforts to re-establish a sovereign state as a homeland for the Jewish nation. These efforts were initiated by Theodore Herzl, founder of the Zionist movement, and were given added impetus by the Balfour Declaration of 1917, which asserted the British Government's support for the recreation of a Jewish homeland in roughly its original position, which was then known as Palestine. In the years following World War I, Palestine became a British Mandate and the number of Jews returning to their homeland steadily increased, as did violence between Palestine's Jewish and Arab communities. Mounting British efforts to restrict this immigration were countered by international support for Jewish national aspirations following the near-extermination of European Jewry by the Nazis during World War II. This support led to the 1947 UN partition plan, which would have divided Palestine into separate Jewish and Arab states, with Jerusalem under UN administration. On May 14, 1948, immediately after the British quit Palestine, the State of Israel was proclaimed and was immediately invaded by armies from neighboring Arab states, which rejected the UN partition plan. This conflict, Israel's War of Independence, was concluded by armistice agreements between Israel, Egypt, Jordan, Lebanon, and Syria in 1949 and resulted in a 50% increase in Israeli territory. The U.S. immediately recognized Israel and gave large amounts of financial aid through private sources, but did not at this time send military aid. In 1956, French, British, and Israeli forces engaged Egypt in response to its nationalization of the Suez Canal and blockade of the Straits of Tiran. Israeli forces withdrew in March 1957, after the United Nations established the UN Emergency Force (UNEF) in the Gaza Strip and Sinai. This war resulted in no territorial shifts and was followed by several years of terrorist incidents and retaliatory acts across Israel's borders. In June 1967, Israeli forces in the Six-Day War struck targets in Egypt, Jordan, and Syria in response to Egyptian President Nasser's ordered withdrawal of UN peace keepers from the Sinai Peninsula and the buildup of Arab armies along Israel's borders. After 6 days, all parties agreed to a cease-fire, under which Israel retained control of the Sinai Peninsula, the Golan Heights, the Gaza Strip, the formerly Jordanian-controlled West Bank of the Jordan River, and East Jerusalem. On November 22, 1967, the Security Council adopted Resolution 242, the "land for peace" formula, which called for the establishment of a just and lasting peace based on Israeli withdrawal from territories occupied in 1967 in return for the end of all states of belligerency, respect for the sovereignty of all states in the area, and the right to live in peace within secure, recognized boundaries. The Six Day War had a momentous effect on American Jews, mobilizing new support for Israel. The following years were marked by continuing violence across the Suez Canal, punctuated by the 1969-70 War of Attrition between Israel and Egypt. On October 6, 1973—Yom Kippur (the Jewish Day of Atonement), the armies of Syria and Egypt launched an attack against Israel. Although the Egyptians and Syrians initially made significant advances, Israel was able to push the invading armies back beyond the 1967 cease-fire lines by the time the United States and the Soviet Union helped bring an end to the fighting. In the UN Security Council, the United States supported Resolution 338, which reaffirmed Resolution 242 as the framework for peace and called for peace negotiations between the parties. In the years that followed, sporadic clashes continued along the cease-fire lines but guided by the U.S., Egypt, and Israel continued negotiations. In November 1977, Egyptian President Anwar Sadat made a historic visit to Jerusalem, which opened the door for the 1978 Israeli-Egyptian peace summit convened at Camp David by President Carter. These negotiations led to a 1979 peace treaty between Israel and Egypt, pursuant to which Israel withdrew from the Sinai in 1982, signed by President Sadat of Egypt and Prime Minister Menahem Begin of Israel. In the years following the 1948 war, Israel's border with Lebanon was quiet relative to its borders with other neighbors. After the expulsion of Palestinian fighters from Jordan in 1970 and their influx into southern Lebanon, however, hostilities along Israel's northern border increased and Israeli forces crossed into Lebanon. After passage of Security Council Resolution 425, calling for Israeli withdrawal and the creation of the UN Interim Force in Lebanon peacekeeping force (UNIFIL), Israel withdrew its troops. In June 1982, following a series of cross-border terrorist attacks and the attempted assassination of the Israeli Ambassador to the U.K., Israel invaded Lebanon to fight the forces of Yasser Arafat's Palestine Liberation Organization (PLO). The PLO withdrew its forces from Lebanon in August 1982. Israel, having failed to finalize an agreement with Lebanon, withdrew most of its troops in June 1985 save for a residual force which remained in southern Lebanon to act as a buffer against attacks on northern Israel. These remaining forces were completely withdrawn in May 2000 behind a UN-brokered delineation of the Israel-Lebanon border (the Blue Line). Hezbollah forces in Southern Lebanon continued to attack Israeli positions south of the Blue Line in the Sheba Farms/Har Dov area of the Golan Heights. The victory of the U.S.-led coalition in the Persian Gulf War of 1991 opened new possibilities for regional peace. In October 1991, the United States and the Soviet Union convened the Madrid Conference, in which Israeli, Lebanese, Jordanian, Syrian, and Palestinian leaders laid the foundations for ongoing negotiations designed to bring peace and economic development to the region. Within this framework, Israel and the PLO signed a Declaration of Principles on September 13, 1993, which established an ambitious set of objectives relating to a transfer of authority from Israel to an interim Palestinian authority. Israel and the PLO subsequently signed the Gaza-Jericho Agreement on May 4, 1994, and the Agreement on Preparatory Transfer of Powers and Responsibilities on August 29, 1994, which began the process of transferring authority from Israel to the Palestinians. On October 26, 1994, Israel and Jordan signed a historic peace treaty, witnessed by President Clinton. This was followed by Israeli Prime Minister Rabin and PLO Chairman Arafat's signing of the historic Israeli-Palestinian Interim Agreement on September 28, 1995. This accord, which incorporated and superseded previous agreements, broadened Palestinian self-government and provided for cooperation between Israel and the Palestinians in several areas. Israeli Prime Minister Yitzhak Rabin was assassinated on November 4, 1995, by a right-wing Jewish radical, bringing the increasingly bitter national debate over the peace process to a climax. Subsequent Israeli governments continued to negotiate with the PLO resulting in additional agreements, including the Wye River and the Sharm el-Sheikh memoranda. However, a summit hosted by President Clinton at Camp David in July 2000 to address permanent status issues—including the status of Jerusalem, Palestinian refugees, Israeli settlements in the West Bank and Gaza, final security arrangements, borders, and relations and cooperation with neighboring states—failed to produce an agreement. Following the failed talks, widespread violence broke out in Israel, the West Bank, and Gaza in September 2000. In April 2001 the Sharm el-Sheikh Fact Finding Committee, commissioned by the October 2000 Middle East Peace Summit and chaired by former U.S. Senator George Mitchell, submitted its report, which recommended an immediate end to the violence followed by confidence-building measures and a resumption of security cooperation and peace negotiations. Building on the Mitchell report, In April 2003, the Quartet (the U.S., UN, European Union (EU), and the Russian Federation) announced the "roadmap," a performance-based plan to bring about two states, Israel and a democratic, viable Palestine, living side by side in peace and security. Despite the promising developments of spring 2003, violence continued and in September 2003 the first Palestinian Prime Minister, Mahmoud Abbas (Abu Mazen), resigned after failing to win true authority to restore law and order, fight terror, and reform Palestinian institutions. In response to the deadlock, in the winter of 2003-2004 Prime Minister Ariel Sharon put forward his Gaza disengagement initiative, proposing the withdrawal of Israeli settlements from Gaza as well as parts of the northern West Bank. President Bush endorsed this initiative in an exchange of letters with Prime Minister Sharon on April 14, 2004, viewing Gaza disengagement as an opportunity to move towards implementation of the two-state vision and begin the development of Palestinian institutions. In a meeting in May 2004 the Quartet endorsed the initiative, which was approved by the Knesset in October 2004. The run-up to disengagement saw a flurry of diplomatic activity, including the February 2005 announcement of Lieutenant General William Ward as U.S. Security Coordinator; the March 2005 Sharon-Abbas summit in Sharm el-Sheikh; the return of Egyptian and Jordanian ambassadors to Israel; and the May 2005 appointment of former World Bank president James D. Wolfensohn as Special Envoy for Gaza Disengagement to work for a revitalization of the Palestinian economy after disengagement. Wolfensohn's direct involvement spurred Israeli-Palestinian agreement on the Gaza ‘crossings" at Karni and Erez, on the demolition of settler homes, water, electricity, and communications infrastructure issues, as well as other issues related to the Palestinian economy. On August 15, 2005, Israel began implementing its disengagement from the Gaza Strip, and the Israeli Defense Forces completed their withdrawal, including the dismantling of 17 settlements, on September 12. After broad recognition for Prime Minister Sharon's accomplishment at that fall's UN General Assembly, international attention quickly turned to efforts to strengthen Palestinian governance and the economy in Gaza. The United States brokered a landmark Agreement on Movement and Access between the parties in November 2005 to facilitate further progress on Palestinian economic issues. However, the terrorist organization Hamas—building on popular support for its "resistance" to Israeli occupation and a commitment to clean up the notorious corruption of the Palestinian Authority (PA)--took a majority in the January 2006 Palestinian Legislative Council (PLC) elections, with Hamas leader Ismail Haniya as Prime Minister. The Israeli leadership pledged not to work with a Palestinian government in which Hamas had a role. Shortly following Hamas' PLC victory, the Quartet—comprised of the United States, European Union, United Nations. and Russia—outlined three basic principles the Hamas-led PA must meet in order for the U.S. and the international community to reengage with the PA: renounce violence and terror, recognize Israel, and respect previous agreements, including the roadmap. The Hamas-led PA government rejected these principles, resulting in a Quartet statement of "grave concern" on March 30, 2006 and the suspension of U.S. assistance to the PA, complete prohibition on U.S. Government contacts with the PA, and prohibition of unlicensed transactions with the PA government. The Palestine Liberation Organization (PLO) under the leadership of PLO Chairman and PA President Mahmud Abbas (Abu Mazen), by contrast, remained consistently committed to the Quartet principles. Israeli tanks, Gaza strip borders, 2007. Despite several negotiated cease-fires between Hamas and Fatah, violent clashes in the Gaza Strip—and to a lesser extent in the West Bank—were commonplace between December 2006 and February 2007 and resulted in dozens of deaths and injuries. In an attempt to end the intra-Palestinian violence, the King of Saudi Arabia invited Palestinian rivals to Mecca, and on February 9, 2007, Abbas and Hamas leader Haniya agreed to the formation of a Palestinian national unity government and a cessation of violence. Hamas' rejectionist policies and violent behavior continued despite the formation of the national unity government. In June 2007, Hamas effectively orchestrated a violent coup in Gaza. Hamas also launched scores of Qassam rockets into southern Israel in an attempt to involve Israel in the Hamas-Fatah conflict. On June 14, Palestinian Authority President Mahoud Abbas exercised his lawful authority by declaring a state of emergency, dissolving the national unity government, and replacing it with a new government with Salam Fayyad as Prime Minister. The new Palestinian Authority government under President Abbas and Prime Minister Fayyad has no elements controlled by Hamas. The new government claims they are dedicated to peace and the Quartet principles and has been embraced politically and financially by the international community, including Israel, mainly because of the far worse alternative that Hamas represent. In November 2007, Israeli and Palestinian leaders participated in an international conference in Annapolis, at which they committed to launching bilateral negotiations towards the establishment of a Palestinian state in the West Bank and Gaza, and the realization of Israeli-Palestinian peace. During the year that followed, Israeli Prime Minister Olmert and Palestinian Authority President Abbas and other members of their governments engaged in regular bilateral negotiations on final status issues. Although the two sides reportedly narrowed their differences on some issues, the negotiations were suspended in December 2008 when conflict broke out between Israel and Hamas in Gaza. On December 27, 2008, in response to a sharp increase in the number and frequency of rocket attacks into Israel shortly prior to and following the formal expiration of a 6-month "calm" between Israel and Hamas, the Israel Defense Forces launched Operation Cast Lead, targeting Hamas security installations, personnel, and other facilities in the Gaza Strip. The Israeli military operation continued until January 18, 2009, when Israel and Hamas each declared a unilateral cease-fire. On January 22, 2009, President Barack Obama named Senator Mitchell his and Secretary of State Hillary Clinton's special envoy for Middle East peace. Special Envoy Mitchell immediately traveled to the region and subsequently returned on a nearly monthly basis in an effort to help create the conditions that would support a two-state solution and to re-launch credible and productive negotiations. The President has visited Turkey, Egypt, and Saudi Arabia and hosted Prime Minister Netanyahu and numerous Arab heads of state in Washington, DC. On September 22, 2009, he hosted a trilateral meeting with Prime Minister Netanyahu and President Abbas, and he has written to over a dozen Arab heads of state asking for their assistance in ending the Arab-Israeli conflict. Senator Mitchell began indirect talks between the two parties in March 2010, and direct talks were launched on September 2, 2010, in Washington, DC. Secretary Clinton has met many leaders from the region and has traveled to the Middle East multiple times since her appointment to promote a Middle East peace settlement. On December 6, 2017, pursuant to the Jerusalem Embassy Act of 1995, U.S. President Donald Trump authorized a move of the US Embassy to Israel from Tel Aviv to Jerusalem, as Israel's capital city. Five months later, on May 14, 2018, the embassy in Jerusalem was opened at the location of the previous U.S. Consulate in Jerusalem. Laqueur, Walter, and Rubin, Barry, eds. The Israel-Arab Reader: A Documentary History of the Middle East Conflict (7th ed. 2008) 626p. Durant, Will. Our Oriental Heritage (1935); A general history of the ebb and flow of civilizations in the area. Photographic Archive The Jewish Museum. Under a "Pillar of a Cloud"
Then, from Egypt to Israel: Now, from Russia and the U.S. File available from the United States Federal Government. This page was last modified on 9 April 2019, at 10:33. This page has been accessed 130,116 times.